What do an Oklahoma bandit, a traveling carnival, Skeletor, and the Six Million Dollar Man have in common? To find out, you need to know the story of Elmer McCurdy, the bungling outlaw who wouldn’t be taken alive, and who had more success in death than he ever did in life. Elmer McCurdy was born on New Year’s Day in 1880 in the town of Washington in the southern part of Maine. He was the son of an unwed 17-year-old by the name of Sadie. The father was rumored to be Sadie’s cousin, Charles Smith, a name that McCurdy would use as one of his aliases during his later years. The baby was raised by Sadie’s brother George, and his wife Helen as their own. Ten years later, George died of tuberculosis, and Helen, Sadie, and Elmer moved sixty miles away to Bangor, Maine. Sometime during his teen years, Sadie confessed to Elmer that she was his real mother, not Helen, and that she wasn’t sure who his biological father was. During his mid-teen years, McCurdy worked with his grandfather as an apprentice plumber. He began drinking during this time, but was, by all accounts, a good worker. In 1898, McCurdy lost his job, and in 1900 Sadie passed away, followed one month later by his grandfather. McCurdy left Maine after the death of his mother and grandfather and, over the course of the next few years, worked as a lead miner and as a plumber. His drinking continued and made it difficult for him to keep a steady job. On at least one occasion, in 1905, he was arrested for public intoxication. Then in 1907, McCurdy joined the Army. He served as a machine gun operator at Fort Leavenworth, Kansas. He was honorably discharged from the Army in 1910. While in the Army, he gained some (little) knowledge of explosive ordinance, in particular, he learned how to work with nitroglycerin. By 1911, McCurdy was living in Lenapah, Oklahoma where his short-lived career as a bungling bandit began. In March, he and three other men decided to rob the Iron Mountain-Missouri Pacific train. They stopped the train and located the safe, but McCurdy used too much nitro to blow the safe open and wound up destroying most of the money that was inside. Instead of making off with the four-thousand dollars that were inside the safe, they only managed to salvage four-hundred and fifty dollars, including silver coins that were melted and fused together. Later that same year, in September, McCurdy and two of his gang attempted to rob the Citizens Bank in Chautauqua, Kansas with pretty much the same results. McCurdy, using nitroglycerin to blow open the door of the bank’s outer vault, wound up blasting the door of the vault through the bank, destroying the interior of the bank, but leaving the safe inside the vault untouched. Before they were able to successfully blow open the safe, their lookout man was scared off, so the remaining bandits grabbed one-hundred and fifty dollars in coins and fled. The final entry in his criminal log took place on October 4, 1911, near Okesa, Oklahoma. McCurdy and his accomplices had heard that a particular train was carrying four-hundred thousand dollars that was on its way to the Osage Nation. However, in his usual bungling style, McCurdy and his gang stopped the wrong train. This was a passenger train with no big payday for the bandits. Instead of the four hundred thousand dollars they were expecting, they made off with forty-six dollars, a pocket watch, a coat, a revolver, and two jugs of whiskey. McCurdy fled to a ranch belonging to a friend of his named Charlie Revard near Bartlesville, Oklahoma. He spent the next couple of days hiding out in a hay shed, drinking the stolen whiskey. On the morning of October 7th, a posse, which had trailed him to the ranch, surrounded the hay shed and a gunfight ensued which lasted about an hour before McCurdy was killed by a single shot to the chest. McCurdy’s body was taken to nearby Pawhuska, Oklahoma, to the Johnson Funeral Home where his body was embalmed with an arsenic-based embalming fluid that was in common use at the time. This type of embalming fluid was used, particularly when they weren’t sure if the body would be claimed by anyone within a reasonable amount of time because it helped preserve the features of the body for a longer period. It’s probably a good thing that the undertaker, Joseph L. Johnson, used this method because McCurdy’s body went unclaimed for the next five years. Sometime during this five years, the enterprising undertaker decided that he might as well make some of his money back while he was waiting for someone to come and claim the body, so he propped McCurdy up in a coffin and charged onlookers five cents apiece to see “The Bandit Who Wouldn’t Give Up.” People would drop their nickels into McCurdy’s open mouth where they would later be retrieved by Johnson, who wound up making quite a substantial side income from McCurdy’s corpse. Finally, in October of 1916, two men showed up claiming to be McCurdy’s brothers. After convincing Johnson and the Osage County Sheriff of their rightful claim to the body, they took possession and hauled McCurdy away to give him a proper burial. As it turned out, the two men weren’t McCurdy’s brothers at all. Instead, they were two carnival promoters named James and Charles Patterson, owners of the Great Patterson Carnival Show. After hearing of the success of Johnson in exhibiting McCurdy’s body to the public, they concocted the scheme to get McCurdy for their own use. For the next six years, “The Outlaw Who Would Never Be Captured Alive” traveled the country with the Patterson carnival. This was just the beginning of McCurdy’s strange journey. In 1922, James Patterson sold his carnival to a man named Louis Sonney who operated the traveling “Museum of Crime” which featured wax figures of famous outlaws. In 1933, Sonney loaned the body out to director Dwain Esper who used it to promote his film "Narcotic." Esper would prop McCurdy’s body up in the lobby of movie theaters as an example of what drug addiction would do to a person. Sonney died in 1949, and McCurdy’s body was placed in storage in Los Angeles for fifteen years. Then in 1964, Louis’s son Dan lent the body to another filmmaker, David F. Friedman, where it played a part in his 1967 film "She Freak." In 1968, Dan Sonney sold the body, along with some wax figures, to the Hollywood Wax Museum. The owner, Spoony Singh, allowed the body to be exhibited in a show at Mount Rushmore. By now, the corpse had deteriorated quite a bit, the body shrinking in size and the skin hardening and tightening. To add insult to injury, while at Mount Rushmore, McCurdy sustained some damage, losing the tips of his ears and some fingers and toes in a windstorm. By now, he was probably already thought to be an actual wax figure. Singh retired poor old McCurdy until 1976 when he sold him to Ed Liersch who was part owner of an amusement park in Long Beach, California, where McCurdy found a place hanging from a gallows in the “Laff in the Dark” funhouse. The amusement park, called the Pike, was in a rough part of town with tattoo parlors and bars, and it provided a rather seedy atmosphere that attracted several television shows including Columbo and The Six Million Dollar Man. It was on December 8th, 1976, when the production crew for The Six Million Dollar Man was preparing to film a scene in the funhouse at the Pike when a crew member went to move the body of Elmer McCurdy. The body had a waxy complexion and had been painted orange and looked out of place in the scene. When the crew member picked up the body, an arm fell off revealing human bone and tissue. 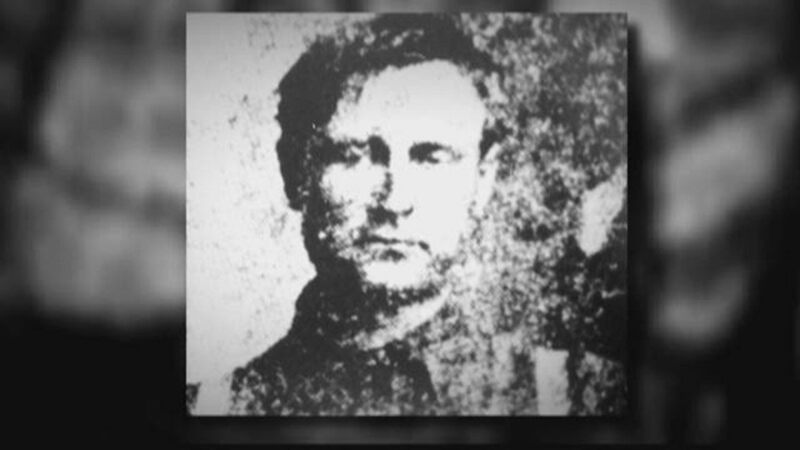 The authorities were called and over the next few days, a number of clues helped them to identify the body as that of the Oklahoma bandit, Elmer McCurdy. Among these clues were a 1924 penny and ticket stubs to Louis Sonney’s Museum of Crime that were lodged inside the throat of the corpse. The Chief Medical Examiner for Los Angeles County allowed the body to be turned over to officials from Oklahoma, and on April 22, 1977, Elmer McCurdy reached his final destination in the Boot Hill section of the Summit View Cemetery in Guthrie, Oklahoma. Two feet of concrete was poured over the casket before the grave was filled in – just to make sure that McCurdy stayed put. 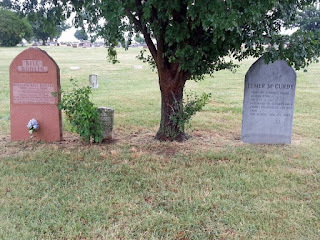 As fate would have it, Elmer McCurdy, the bungling bandit who never pulled off a successful heist, was laid to rest next to one of the most successful outlaws in the history of the American west – Bill Doolin, founder of the Wild Bunch. Whether McCurdy has picked up any pointers from Doolin since being interred next to him is a matter of speculation. Although McCurdy was finally laid to rest, his influence continues. He has been the subject of several documentaries and television shows. 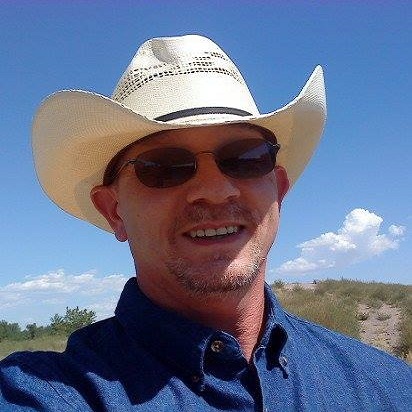 He was the inspiration for a 2009 song entitled, “Body of an Outlaw” by the group Rotary Downs. He was the inspiration for the mystery book, “The Castlemaine Murders” by Kerry Greenwood. He even has a pizza named after him in the Washington General Store in his hometown of Washington, Maine. He is also suspected of being the inspiration behind the highly popular Jonah Hex comics and film franchise, as well as the inspiration of the Mattel toy, Skeletor, who was created by a Mattel toy engineer after recalling a scary afternoon in the Laff-In-The-Dark Funhouse in Long Beach as a child. Very interesting post, Michael! I have lived in OK all my life and didn't know he was buried in Guthrie. That's just about 45 minutes from my house, so I think a road trip is in order, and I didn't know that Bill Doolin was buried there, either! Learn something every day! Thanks for posting this! I'm glad you enjoyed the story, Cheryl. I'd love to get my own photo of Bill Doolin and Elmer McCurdy side-by-side. What an amazing story. Thank you for digging it up and sharing. It was my pleasure. I had fun researching the story. I'm so glad you liked it. I'm glad that you enjoyed it, Mary Beth. And thanks for the link to the Iron Mountain-Pacific Railroad. I love those old trains!